Sixty years ago a quiet corner of Norfolk was home to one of the Royal Air Force’s most secret airfields. 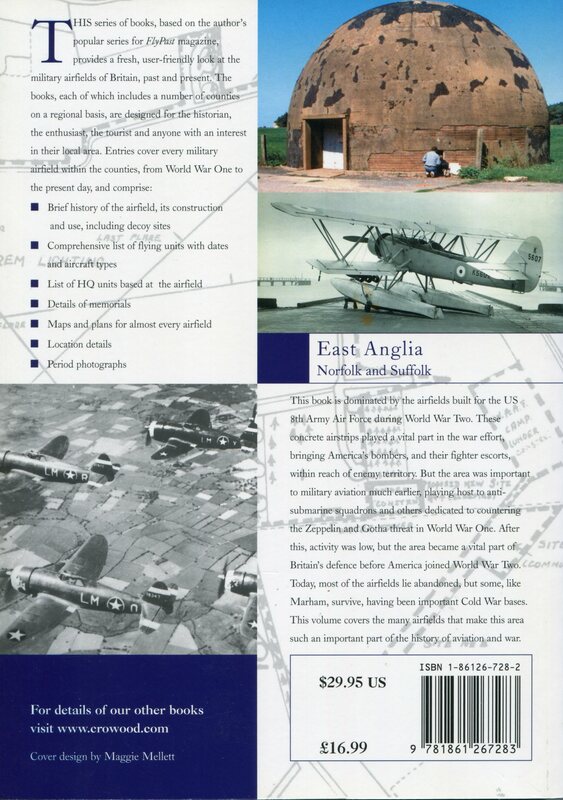 Located in the northern part of the County a few miles North of Fakenham on the Walsingham-Wells road, North Creake airfield was constructed during 1942-1943 and opened in November of the latter year as a base for aircraft of Bomber Command. 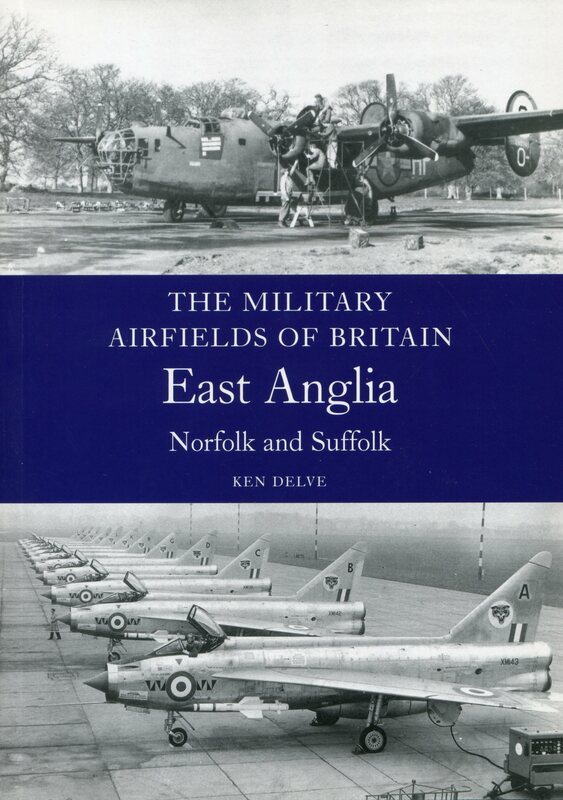 A large number of airfields were being constructed in East Anglia during this period, partly to accommodate the ever-increasing number of United States Army Air Force (USAAF) units and partly for RAF units that had moved from their home airfields to make way for the Americans. The village of North Creake was typical of many that suddenly found themselves ‘in the war’ and a typical bomber airfield with three runways and associated taxiways, dispersals and buildings sprang up over what had once been quiet farmland. 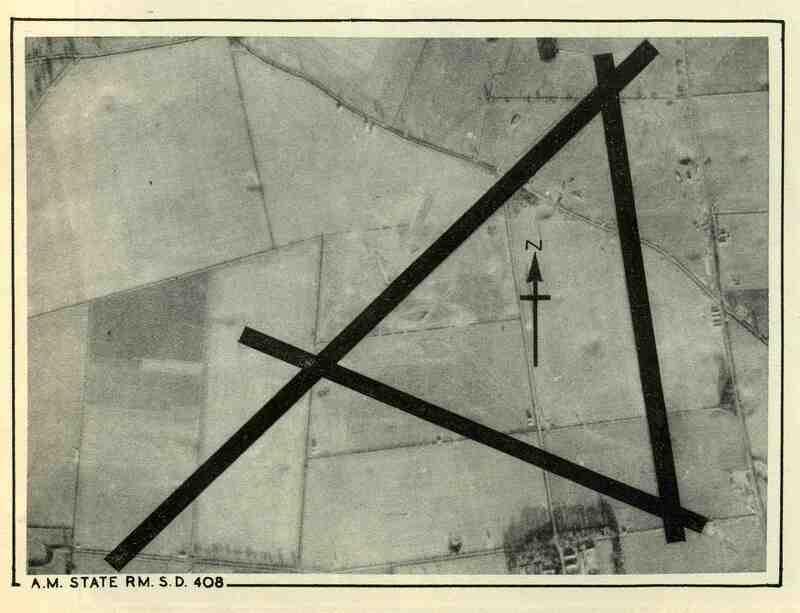 It was not until April 1944 that the new airfield received its first operational aircraft, with the arrival of No 199 Squadron. The offensive by Bomber Command against Germany was entering its sixth year and every night hundreds of heavy bombers left their bases in England to attack targets throughout Hitler’s Reich. Whilst the bombers wrought great destruction they were not immune and the German defences of fighter aircraft and anti-aircraft artillery often caused heavy losses. In order to nullify the defences special squadrons had been formed within No 100 (Special Duties) Group, whose heartland was Norfolk, and the aircraft from these units played a vital role in protecting the bombers of Main Force. On September 8, 1944 a new unit was formed at North Creake by the expedient of hiving off one Flight of an existing unit at the base, No. 199 Squadron, and expanding it to squadron strength. The historical records of this new unit, No. 171 Squadron, include a rare survival – the correspondence between the Squadron Commander, Wing Commander M W Renaut, and J D Heaton-Armstrong, the Chester Herald with responsibility for RAF heraldry, in this case the Badges adopted by RAF units. Most of the RAF’s almost 600 World War Two operational squadrons were granted such badges but it is unusual for us to have the details behind the choice of motif and motto. 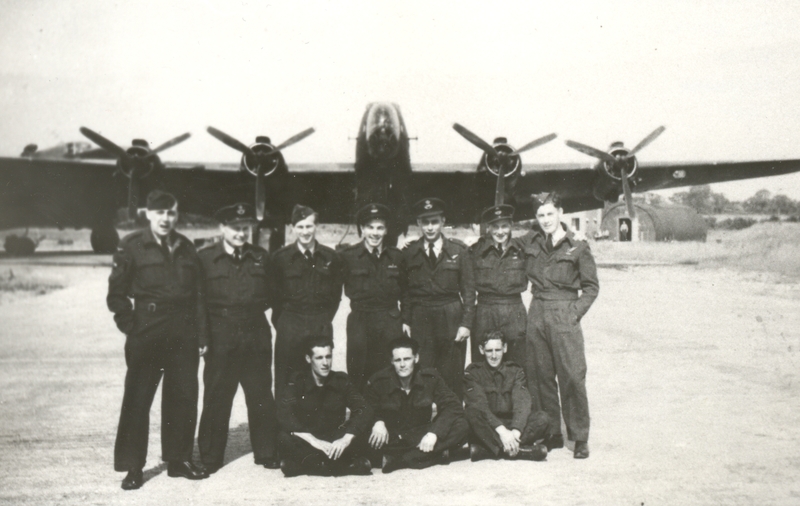 In the case of No 171 Squadron there is a poignant twist in the tale – but more of that later. On September 21, 1944, Heaton-Armstrong acknowledged a letter from Wing Commander Renaut concerning “your new squadron” and asking for more details of the type of motif the Squadron would like. The Squadron Commander Officer (CO) replied on October 8: “I am not at liberty to discuss the role of the Squadron, as it is engaged on work of a most secret nature. 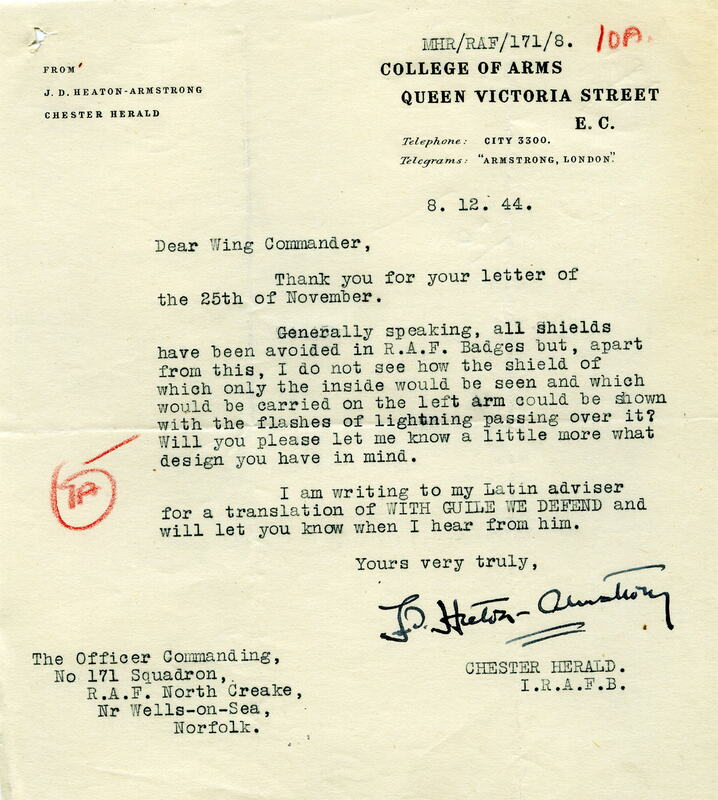 I would suggest, however, a shield or Hermes, with flashes of lightning, as the Squadron is engaged on work of a Signals nature.” At the time the work of the squadrons of No 100 Group was highly classified and the Short Stirlings and Handley Page Halifaxes with which No 171 Squadron was equipped were employed to drop ‘window’, strips of aluminium foil that blanked out the radar screens of the German defences and thus made it difficult for them to find and attack the bombers. The Squadron in fact had a dual role, being part of the Special Window Force (SWF) but also carrying out electronic jamming of German radar as part of the ‘Mandrel’ screen. This latter work was carried out by the Stirlings and the Squadron flew its first such mission on September 15, 1944. ‘Mandrel’ was designed to blot out the display screens of German early-warning (EW) radars thus masking the approach of the bomber force and it proved highly successful. ‘Window’ had been is use for a number of years but the creation of a special force to drop masses of this material, again with the aim of blotting out enemy radar, was part of the growth of No 100 Group. The Chester Herald replied on September 23: “If something generally symbolic of signals will meet your wishes I have no doubt we shall arrive at something satisfactory. Hermes and the head of Hermes have already been taken for badges, but there is no demi Hermes holding, or in front of, lightning. Would you like this?” When choosing a motif for its badge a Squadron would usually try to come up with something that encapsulated either their role or their location; indeed, these badges are wonderful little snapshots of a particular period in a squadron’s history. 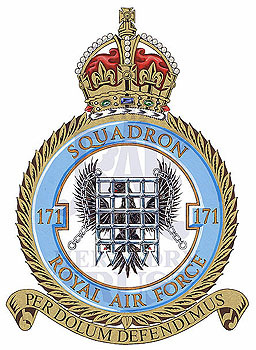 However, this does mean that for squadrons that have been in existence for some time the badge they have may no longer represent their current role. As an example, No 39 Squadron, currently based at RAF Marham, has been a reconnaissance squadron since 1958 but its badge is a ‘winged bomb’. The badge was created in the 1930s when the unit was a day and night bomber squadron, for which the motif and the motto of ‘Die Noctuque’ (By Day and By Night) was perfect. However, as we will see, this was not to be the case with No 171 Squadron. Wing Commander Renaut replied on October 19 that the idea of a demi-Hermes was fine and requested a sketch of how the badge would look. A sketch was duly sent on November 22 but sadly the file does not include the sketch, or any of the sketches referred to in the correspondence; nevertheless, the descriptions are vivid and Mary Denton, the artist from the RAF Heraldry Trust, has drawn up what we think the badge would have looked like. The description in the letter of November 22 mentions a demi Hermes holding his staff and two flashes of lightning’ and the question of colours is then raised, with the Chester Herald writing: “I would suggest blue with a gold helmet, staff and lightning. Let me know what motto you have in mind.” Three days later the Squadron Commander replied that he liked it but requested it be amended “so the Hermes is holding a shield, with lightning passing over it. As regards motto, I think the Latin translation of ‘with guile we defend’ would be very appropriate.” One of the problems for the Chester Herald was that he having to second-guess what the Squadron did; knowing, as we do now that the Squadron was a protective shield against the electronic beams of the enemy radar the desire of the CO to have a shield over which lightning passes – but does not penetrate – is perfectly understandable as it encapsulates the Squadron’s view of what it was doing. The vast majority of RAF badges use Latin mottos and most of these were created from English phrases supplied by the units, although in some case they supplied the phrase in Latin (not always of an accuracy that a Classical scholar would support!) However, some units used other languages or scripts often relating to the area in which they were operating – No 100 squadron, for example, having a motto in Malay as they were stationed in Singapore at the period in the 1930s when the badge was created. The Chester Herald appeared unruffled, or a least his next letter to the Squadron contained no hint of disapproval: “would not your latest suggestion be best symbolized by placing a portcullis in front of an eagle displayed? I do not know whether your functions are stopping the hun eagle as much as interfering with his messages, so that it is difficult for me to judge how far the suggestions are appropriate.” This was almost a shrewd guess as to the Squadron’s role and the idea of a portcullis fitted more with standard heraldic motifs; indeed, the portcullis is a frequent device within such badges. The ‘eagle displayed’, is again a heraldic term simply meaning front on with wings outstretched. The desire for a silver portcullis, when most such devices in heraldic work are gold, was based on the Squadron’s use of ‘window’ – aluminium (silver) strips, although the first sketch sent by the Chester Herald had the portcullis depicted in gold. A week later Heaton-Armstrong queried the motto: “do you think the motto is appropriate for the new badge? The portcullis hardly seems to suggest ‘per dolum.’ In other words, he was questioning whether a portcullis was ‘with guile’. Four days later, February 12, the CO replied that a new motto had been sent some time before – ‘we bar thee from thy prey’. The Chester Herald was not impressed: “I am not taken with the motto as it stands. It seems rather long and more of a statement of fact than a motto. Perhaps you can give it further thought.” The Wing Commander then circulated a memo to his Flight Commanders seeking suggestions: “the question of a motto remains unanswered and I would welcome suggestions, should any motto be chosen a small prize will be given to the individual who suggested it.” Sadly this memo of February 28 appears to have borne little fruit and although there must have been ideas put forward these are not recorded and were obviously not worthy of being sent on: the CO wrote to the Chester Herald on April 8: “I am afraid that all efforts by the Squadron to suggest a motto have failed, and I am wondering if it would be possible for you to think of something. The final irony was that on that very day, July 27, 1945, the Squadron was disbanded – never having received its badge. 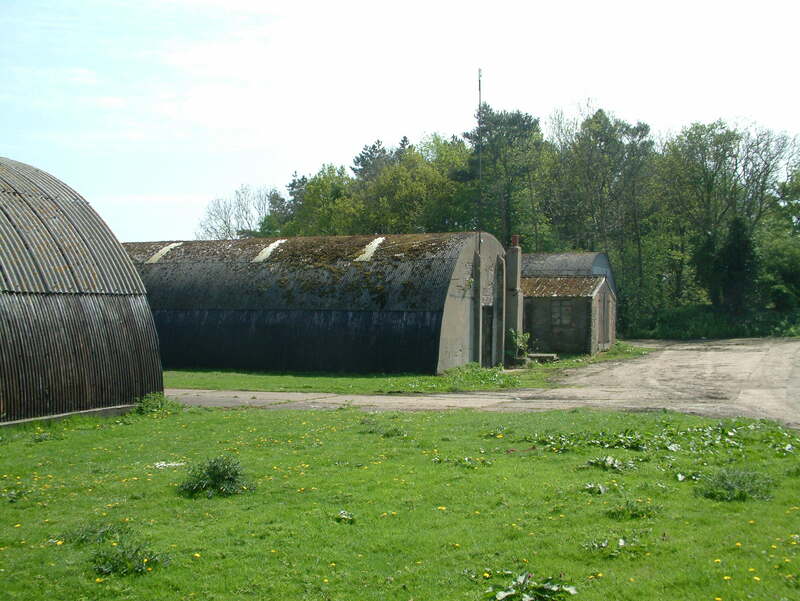 As for North Creake airfield it too was destined for a short life and after the disbandment of the squadrons in July it spent a short time as a storage site for Mosquitoes, whose sad fate was to be cut up for scrap as they were no longer needed. The airfield finally closed in September 1947 and it would be easy now to drive past and not realise that this was once an important part of the Royal Air Force’s war effort. An observant passer can however see that a number of wartime buildings survive and are in use by the present occupants of the site. If you look really carefully you will even see, hidden in the hedgerows, a number of brick-built pill-boxes that once defended this secret airfield.